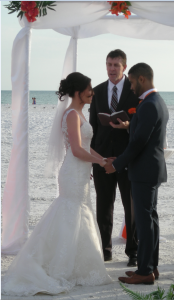 Laura Slough of England and Gregory Peguero of the Dominican Republic exchanging their vows at a wedding ceremony held on spectacular Siesta Beach recently. Laura’s parents and brothers surprised her by taking her and a couple friends from London to New York City to celebrate her 21st birthday. While eating breakfast at a diner the morning of her birthday, Laura noticed Gregory grabbing a coffee to go. As they were leaving, the server brought over a napkin which said, “Gregory, call me” with his phone number on it. Laura decided to text him, but never received a reply. The next day they accidentally met again at a diner. Gregory convinced a waiter to ask where Laura was staying, and sent her two roses with a Happy Birthday note. They hadn’t even spoken at this point. Wondering why she hadn’t heard from him, she came to realize she sent her text to the wrong number. The night before they were heading back, Laura and her friends met Gregory and a couple of his friends for a night in the city. The next day, lack of visibility caused their flight to be canceled. A large ash cloud from a volcano that erupted on Laura’s birthday drifted into the flightpath. As a result, they were delayed another 10 days in New York. 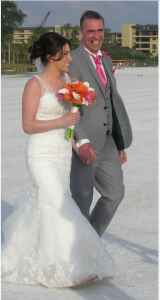 During this “twist of fate”, they got to know each other better and after a four year, long-distance relationship, they tied the knot on Siesta Beach surrounded by close family and friends. Gregory, from the Dominican Republic, was brought to America by his mother with his twin sister and two younger brothers when he was 10 years old. They settled in New York City where Gregory is a struggling model currently working at the NYLO Hotel near 77th and Broadway.